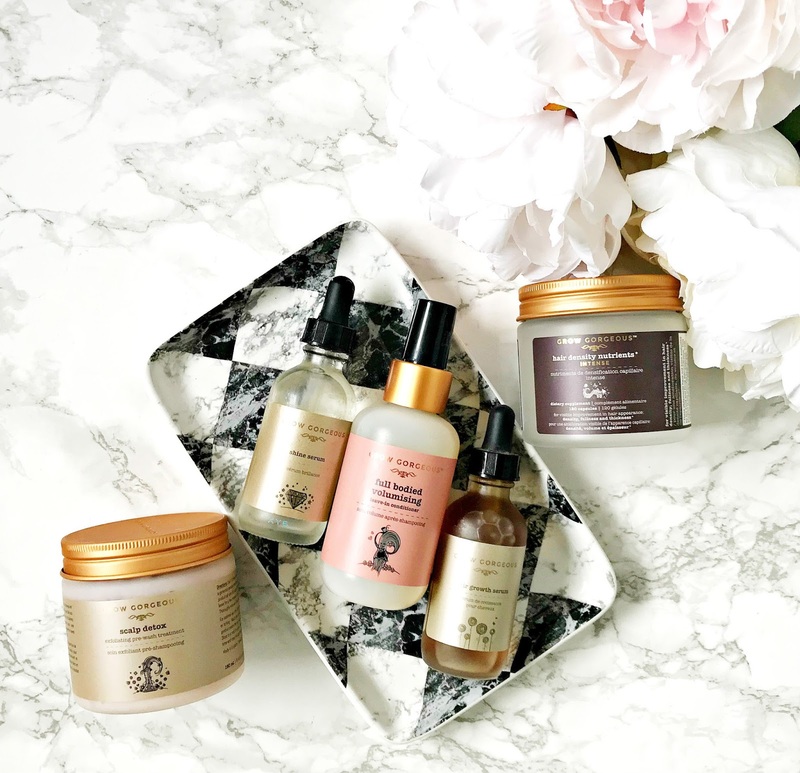 Spring Clean Your Hair & nab a freebie from Grow Gorgeous! Now that the sun has finally started to appear (sporadically! ), it has made me think about the months ahead. Around this time, every year for the last four years, I have started using Grow Gorgeous Hair Growth Serum to get my hair ready for summer! This serum really does help with hair growth - hence why I've repurchased it several times! You will have seen me talk about Grow Gorgeous on the blog on numerous occasions previously because I'm a big fan of the brand and they have very kindly given me a code to share with you so that you can receive a free full size Back Into The Roots Hair Masque with any purchase on their site between now and April 20th. The code is SIOBHANSPRING. Today, I am going to talk you through my favourite products from the brand, which might help you decide what to buy if you want to avail of the code! Scalp Detox: I'm on my third pot of this product! I was delighted to discover this last year because I went through a phase of having an irritated scalp, which meant that it was quite flaky and just generally uncomfortable. I was afraid that using a scrub would strip the colour from my hair, but thankfully it doesn't. I tend to use this scrub once weekly by applying to wet hair and then massaging into the scalp and leaving it to work for a few minutes, before rinsing. I love the cooling sensation that this gives and my scalp is no longer tight or uncomfortable. It makes sense to scrub our scalps, given that we exfoliate everywhere else on our face and body! Hair Density Nutrients: I've just finished the third pot of these nutrients, which are comprised of a blend of biotin, amino acids and hyaluronic acid. The recommended dose is 3 capsules daily and the pot lasts around 6 weeks. My hair is noticeably stronger when I take these capsules - even my hairdresser commented on the condition of my hair, which speaks volumes! Full Bodied Volumising Leave-In Conditioner: This doesn't replace a regular conditioner for me as I have very dry hair, but it may work that way for those with normal or even oily hair. I personally like to use it just before I detangle my hair, which makes it easier to comb through. It doesn't weigh my hair down or make it greasy and I adore the fresh scent. It contains Pea Peptides (which act as a film on each strand of hair), Amino Acids (which encourage cellular renewal) and Pea Derived Proteins (which condition the hair fibres) and the result is smooth, shiny hair! Shine Serum: I love to combine 2/3 drops of this with the leave-in conditioner, which may sound intense but both products are so lightweight that my hair really doesn't look or feel greasy. The shine that this serum gives is almost blinding - if I ever skip this step, I can really see the difference - in a negative way! Because I only need 2/3 drops per use, this bottle will last over a year so it's really great value. Have you tried any Grow Gorgeous products? Have any of these caught your eye? Don't forget to use the code SIOBHANSPRING at the checkout if you decide to order anything so that you can get a free full sized Back Into The Roots Hair Masque! All products are bought by me, unless otherwise stated. These products were kindly sent to me, however I have bought the hair growth serum several times previously myself. Opinion is always my own.